Presbyterians have made up a small but important part of the religious landscape of what is now Mississippi since early in the area’s settlement by Euro-Americans. Since the mid-twentieth century, the state’s various Presbyterian congregations have claimed about thirty thousand members. The organizational history of the Presbyterians, especially the relationship between primarily southern and northern or nationwide organizations, has often mirrored broader changes in the state’s history. The Presbyterians who first populated the American South were primarily Scots-Irish immigrants who came through Philadelphia and New York and Appalachia in the late 1700s and early 1800s. Calvinist in theology, optimistic about education and the frontier, and organized into church sessions, presbyteries, synods, and a national general assembly, the Presbyterians grew slowly in early nineteenth-century Mississippi. In 1800 Presbyterians sent two representatives from North Carolina and Georgia, James Hall and William Montgomery, to tour the Natchez District to consider the possibility of missionary activity. In 1816 Presbyterians met to form their first organization, with Montgomery working with Joseph Bullen, Jacob Rickhow, and James Smylie. Smylie settled in Washington, Mississippi, outside Natchez, working as both a teacher and a minister. The denomination grew relatively slowly, and by 1837 Mississippi was home to three separate presbyteries with twenty-nine ministers and fewer than one thousand members. The three evangelical denominations—Presbyterians, Baptists, and Methodists—defined in large part by their emphasis on revivalism and their insistence on personal transformation as part of the Christian experience, quickly became the dominant religious force in Mississippi. A defining feature of Presbyterians, their insistence on a formally educated ministry, contributed to their growth at a slower pace than their evangelical colleagues. A major question was whether the individualistic and egalitarian aspects of religious experience or the tendency to emphasize order and hierarchy would emerge from evangelical history. The first Presbyterian to become a leader in Mississippi was Smylie, and his proslavery statements helped cement Presbyterianism’s conservative reputation in the state. In the 1830s Smylie rejected abolitionist arguments that slavery was a sin, argued for biblical justification for slavery, and detailed a religious proslavery argument that emphasized the responsibilities of people in charge to care for the bodies and souls of their dependents. Presbyterians made considerable efforts to establish schools and churches among the American Indian populations first in Mississippi and then in Oklahoma after Removal. The first Presbyterian effort to convert Mississippi Indians started in 1818, when missionary Cyrus Kingsbury accepted Choctaw invitations to set up schools and other concerns at Eliot, on the Yalobusha River, and at Mayhew in Oktibbeha County. In the late 1830s Presbyterians divided into the “Old School” and “New School.” The Old School feared tendencies toward association with multiple denominations in missionary work and a growing liberalism on issues of abolition and other forms of activism. Relying on the notion of the “spirituality of the church” to reject this-worldly activism, the Old School Presbyterians emphasized the centrality of conversion and literal interpretations of the Bible. The division was not explicitly sectional, as New School Presbyterians could be found in Mississippi and other southern states and Old School Presbyterians in the North. Still, the division, intensified by slavery issues, seemed a harbinger of greater sectional conflict. In 1861 Presbyterians in the South formed the Presbyterian Church United States (PCUS) to differentiate their group from the northern United Presbyterian Church USA (UPCUSA). From the Civil War through the civil rights period, the dominant group within Presbyterianism was the PCUS. Though the PCUS and the UPCUSA may have looked alike to outsiders (as well as many Presbyterians), the two groups had regionally distinct interpretations of church life and the proper responsibilities for Christians in the world. 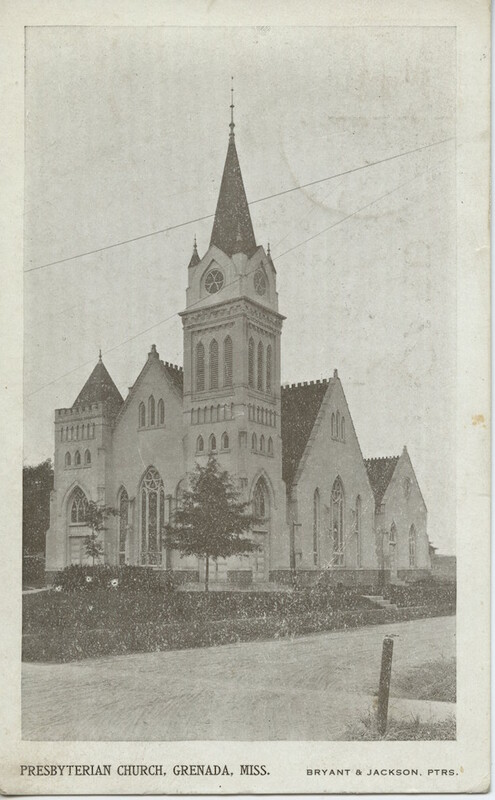 Though the two groups often shared interests, goals, and activities and began exploring the possibility of reunion in the early 1900s, they remained separate denominations until 1983. The national effort at a reunion of Presbyterian bodies took on great significance in Mississippi because it coincided in large part with the civil rights movement. Presbyterians who feared national union with the UPCUSA criticized the group for being soft on biblical inerrancy, for supporting women in leadership roles, and for pushing for racial desegregation or at least criticizing racial injustice. The relationship between ideas about race, theology, and the potential for a national union of Presbyterian bodies made Mississippi the site of some dramatic organizational tensions between the 1950s and 1980s. Guy Gillespie, a Presbyterian minister and the longtime president of Belhaven College, espoused the conservative view in a mid-1950s sermon, “A Christian View on Segregation.” Other Mississippi Presbyterians, however, worked as civil rights activists. Perhaps the most influential Presbyterian in Mississippi was William Winter, the state’s governor from 1980 to 1984, who aggressively advocated desegregation and improved education. A major break came in 1973 when conservatives, almost all of them in the South, broke away from the PCUS to form the Presbyterian Church in America (PCA), in large part out of frustration with the liberal tendencies of those supporting union with the UPCUSA. Sixty of central and southern Mississippi’s one hundred Presbyterian congregations withdrew from the PCUS: according to historian R. Milton Winter, “The Synod of Mississippi, one of the smallest in the PCUS, suffered greater loss than any other in the Presbyterian divisions of the 1970s and ’80s, with the result that one could no longer speak of a ‘solid South’ in Presbyterian terms.” The conservative PCA quickly became a church of substantial influence in Mississippi. In 2016 the PCA had nearly 120 congregations in Mississippi, many of them historically large and important. In 1983 the long-discussed union between the PCUS and UPCUSA led to the formation of a new denomination, the Presbyterian Church USA (PCUSA). The PCUSA’s Synod of Living Waters includes Mississippi, Alabama, Tennessee, Kentucky, and parts of Arkansas and Missouri. Mississippi is divided into the St. Andrew Presbytery, which includes sixty-four congregations in the northern part of the state, and the Mississippi Presbytery, which covers the southern part of the state. In 2016 Mississippi was also home to fourteen congregations belonging to the Cumberland Presbyterian Church, which was formed in 1810 and is headquartered in Memphis, Tennessee; to twenty-one congregations affiliated with the Evangelical Presbyterian Church, a more conservative denomination founded in 1981; and to a handful of other churches associated with other Presbyterian denominations. Leadership at Jackson’s Belhaven College shifted because of the controversies. The college was founded in 1894 and affiliated for eighty years with the PCUS. In 1972 Belhaven’s leaders created a separate board that ran the college with the funding but not direct oversight of the PCUS. Now operating as Belhaven University, the school remains a Christian liberal arts college with close ties to several groups of Presbyterians.